Winner: Landscapes of the Interior. By Don Gayton. Published by New Society Publishers. Don Gayton does with the concept of landscape what writers like Edward Abbey have done with the desert. It is a pioneering, personal journey across a succession of landscapes from the Kokanee Range to the Columbia Plateau to the tall grass prairie of Manitoba. Gayton is sometimes scientific and other times lyrical and deeply philosophical. Through it all, he is always original and fresh. More information. Honorable Mention: The Sacred Place: Witnessing the Holy in the Physical World. Edited by Scott Olsen and Scott Cairns. Published by the University of Utah Press. This anthology includes the poetry and prose of 53 writers including such heavies as Annie Dillard, William Kittredge, Barry Lopez, John McPhee and Terry Tempest Williams. While it wanders a little from outdoor and nature writing, it does provide an inviting glimpse of a turn in American literature toward the natural world as a place of revelation and where the sacred and the physical world take on new and provocative possibilities. By Laura Erickson. Illustrated by Kathryn Marsaa. Published by Pfeifer-Hamilton. Answer: Because it's too far to walk. Winner: Ragged Mountain Press Guide to Outdoor Sports. By Jonathan and Roseann Hanson. Published by Ragged Mountain Press. This 340-page book covers hiking, backpacking, sea kayaking, rafting, climbing, cross-country skiing and mountain biking. While no one book can cover all of these activities comprehensively, it does an excellent job of getting the beginner started in the right direction. Its tips and sidebars on equipment are instructive and well done--and it has one of the best chapters on outdoor clothing found anywhere. Winner: Canoe Country Flora. By Mark Stensaas. Illustrated by Jeff Sonstegard. Published by Pfeifer-Hamilton. 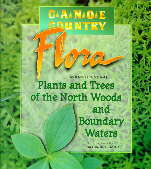 Canoe Country Flora covers a choice selection of trees, shrubs and wildflowers in the broad swath of territory extending from Northern Minnesota to Maine. The author has fun with the book, taking a different tact than most identification guides. He describes how to identify plants, of course, but he does so in a light, pleasant style and supplements the text with a fascinating study of plants' natural and cultural histories. Honorable Mention: The Rocky Mountain Foods Cookbook. Written and illustrated by Darcy Williamson. Cover art by Larry Milligan. Design by Teresa Sales. Published by Caxton Press. Right off the bat, this is an eye catching book with a beautifully done painting of a mountain scene on the cover. The inside is equally attractive with a tastefully sparse layout, plenty of white space to rest the eye and a full color midsection. But it isn't only the design that earned this book an honorable mention. The judges were surprised and delighted with the content: an astonishing selection of delectable dishes, all done with common wild foods.